Have you ever looked for love at 35,000 feet? Virgin America’s eccentric CEO Richard Branson wants you to give it a shot using its in-flight technology that allows you send gifts and flirt with your fellow passengers. 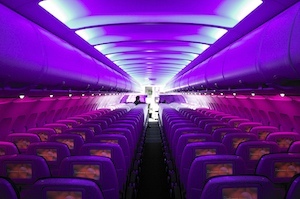 Virgin America planes already come equipped with in-seat entertainment systems that allow flyers to order beverages and snacks. Now, you can use that same touchscreen to order a $14 sandwich or $18 cheese and cracker plate to break the ice with a stranger. The stuff may not taste great, but given that Virgin doesn’t offer free snack service, an overpriced morsel might make you a hero. Once you’ve made that connection with that lovely stranger in 12B, Virgin invites you to use its in-flight chat service to start up a conversation. If that person is interested, you may have just found the love of your life. If not, well, congratulations, you just made someone really uncomfortable for the next several hours. I hope you’re proud of yourself. Though Virgin’s video is clearly meant to be a tongue-in-cheek way of promoting their in-flight offerings, the company’s encouragement of flirting on airplanes is attracting a lot of criticism. It’s one thing to be bought drinks in a bar; it’s another to be bought drinks in a tiny confined space. Can’t people simply get from point A to point B without having to endure advances from a stranger? Check out Sir Richard's pitch and let us know if you would partake in this mile-high offering.